Black's Photograhy was running a promotion last week...50 5x7 photos for $5. Deal, right? Well, we don't always have a lot of success with Black's (at least not on our first attempt, the do-overs usually work out)...in fact, if we send our files in through the website, or download them onto their kiosks, we are left with over sharpened images that look less than professional. The employees at Black's have recommended that we hand our usb stick over, and they will process them without any adjustments. However, this time it was a total fail! I guess we can't expect Black's to check the way the images are auto-cropped. Still, most of my truck photos were chopped off at the front end or back end...we definitely need a do-over. My husband is going to bring the pictures back and see if they can help us out. I also think the colours are washed out, dull, greyish even...I am probably being over sensitive*. Hopefully we will be satisfied customers in the end...Where do you get your images developed? 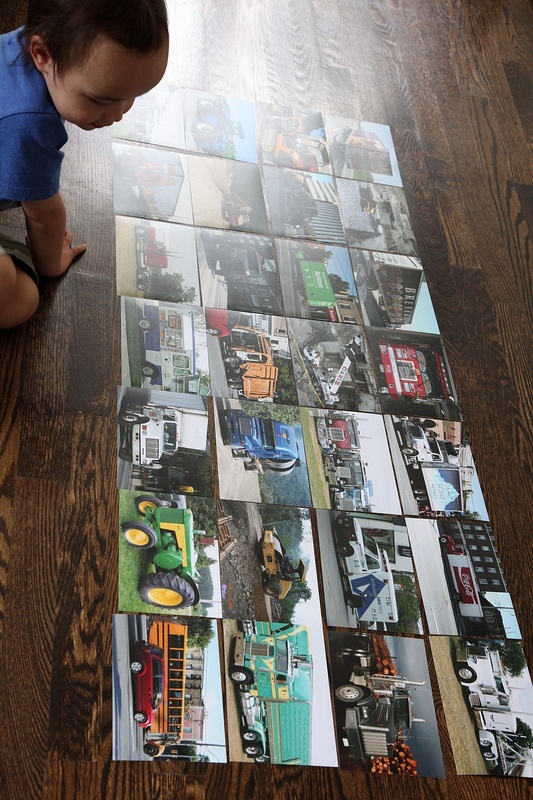 Once we sort it out with Black's, we will have 45 truck photos (there are only 28 in the image above)...enough for a grid of 5 rows of 9 across (35 inches x 63 inches) ...this will be a HUGE collage!!! And it will cost $5 plus whatever a pack of sticky tact costs. I was just in vancouver and developed photos at London Drugs and the images were amazing. I have never come across this quality in Ontario. I too have had some bad luck with Blacks.